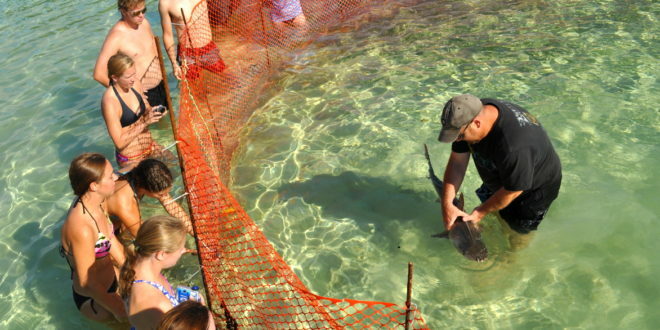 Dr. Bryan Franks handles a baby tiger shark while discussing the species with students. 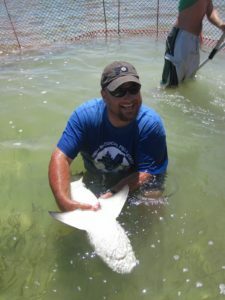 Dr. Bryan Franks starts in mid-August as an Assistant Professor of Biology and Marine Science in the College of Arts and Sciences, after stints including Marine Biology Program Coordinator at Florida Southern College and Managing Director for the Bimini Biological Field Station in the Bahamas. 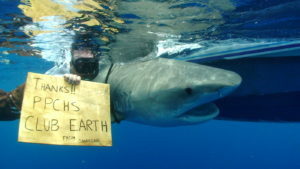 Dr. Bryan Franks sent this photo taken of him and a large tiger shark caught in Bimini as a thank-you to a South Florida high school environmental club that raised money for his Bimini shark lab research efforts. 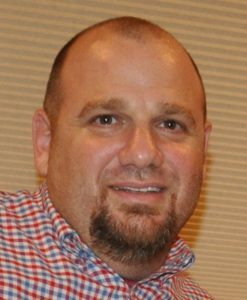 Dr. Franks will begin teaching an introductory course in oceanography and will develop a graduate course in coastal and ocean observing systems that includes usage of shark tagging, satellites to predict weather, ocean drifters and more. Eventually he will embark with students on the M/V OCEARCH research vessel, which is now home-ported in Jacksonville. Dr. Franks will meet with world-renowned OCEARCH founder Chris Fischer and other OCEARCH staff members, with the expectation to be on board with students by next spring. “OCEARCH at Jacksonville University,” a collaboration announced in February, puts the University and its namesake city on the world stage for marine science learning. It also provides one of the global leaders in ocean species research a premier academic home with resources to expand for years to come. OCEARCH, an internationally recognized at-sea laboratory with millions of social media followers and dedicated to studying keystone marine species like great white and tiger sharks, is expected to magnify opportunities for students of JU marine sciences and other programs. It is the largest shark collaborative in the world. For Dr. Franks, the opportunity to work with undergraduate and graduate students, the MSRI faculty, OCEARCH staff and scientists arriving from locations across the globe to further their research was too good to pass up. He was also attracted to JU’s focus on outreach. Among his many awards for shark research are major grants from the SeaWorld & Busch Gardens Conservation Fund, The National Geographic Society Committee for Research and Exploration, The Henry Foundation, The Pew Foundation and The Institute for Ocean Conservation Science. Dr. Franks cut his teeth studying shark biology while doing doctoral research in Bimini, Bahamas, and later served as managing director of the field station in Bimini overseeing shark research at the station. 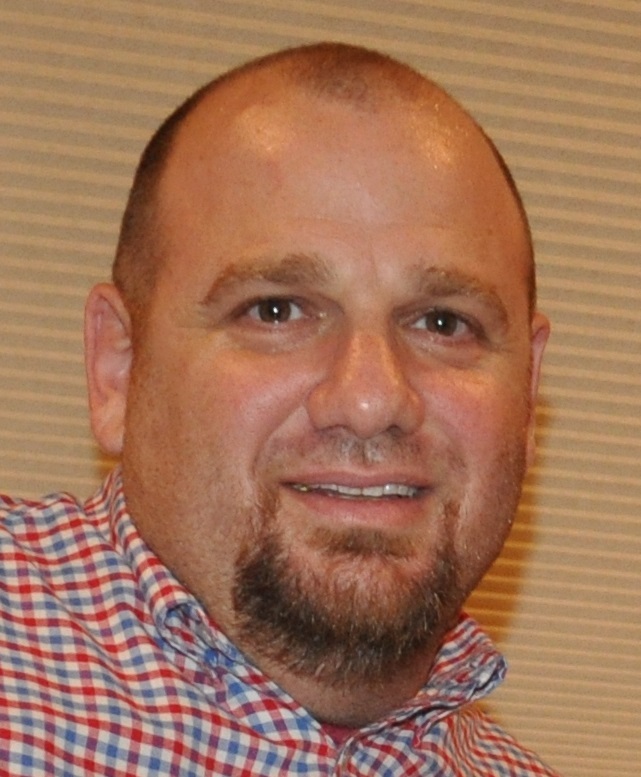 He later taught at Rollins College and then Florida Southern College.